This article is for Breweries only. Note: the old update page will be phased out in the beginning of 2019. Entries can be made using Processes, see “Making Entries using Processes” for more information. The “Make Entries” page is where you will make all of your entries from production to sale. A video overview of the Make Entries page can be found HERE. The first thing you must do after navigating to the Make Entries page is choose a date that the activity took place and a batch number (batch number is optional but HIGHLY recommended). You can make entries effective for the day you are using the software, or for a date in the past (for example, entering wort brewed yesterday). USE WITH CAUTION! Entering data in the past will affect previous reports if the date falls within a previous reporting period. This will change the previous report and will have a domino effect into the current reporting period. Batch ‘Numbers’ can be a number, word, symbols, or a combination. Short and concise is best. You may also want to use the batch number generated by any recipe management software you might use. The best use of TTB Tamer, and a Best Practice that we recommend, is to update entries on the DAY OF (or the day after in the case of a particularly long brew day) so as to always keep your entry information up to date without having to enter information for a past date. The first section of the Make Entries page will show you your current “on hand” beer inventory as of the last time you made an entry. This will keep a running total throughout your use of TTB Tamer and is automatically calculated based on the entries you make further down the page. You cannot directly change these numbers, they are calculated based on your Starting Balances (entered on the Setup page) and any individual Entries that you’ve made. At the beginning of a reporting period, this will reflect your starting balances of beer, and at the end of the period, will be your ending balances. As beer is made, sold, etc. these balances will adjust. 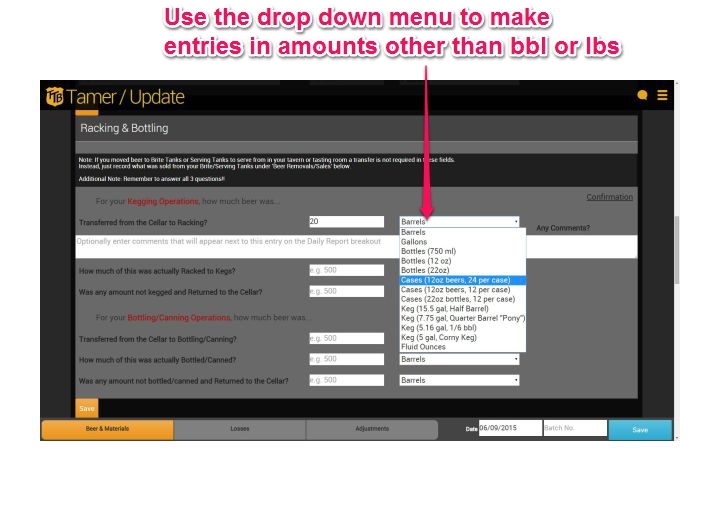 Click on the orange icon to ‘drill down’ and see how TTB Tamer is using your entries to calculate these balances. 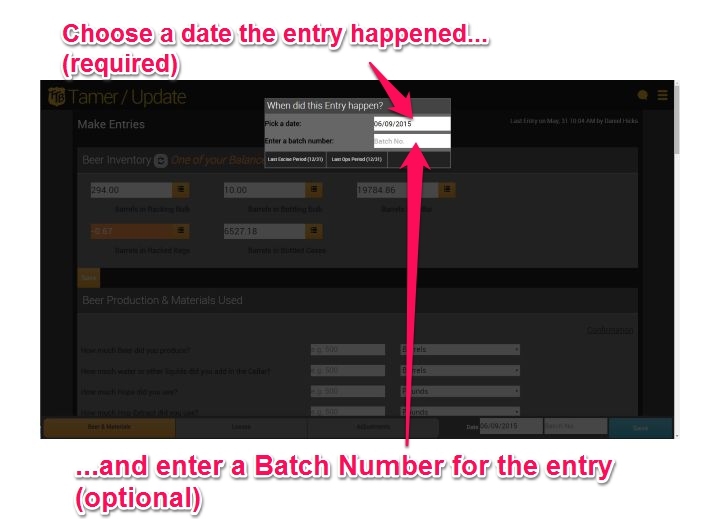 More detailed entry information can be seen using the Entry Log page and Batch History pages. Each section has questions that correspond to possible entries found on the TTB reports. The most common brewery activities have been made the very first questions and chances are that you’ll never need to scroll very far from the first page in order to make all of your entries. For every entry that you make, an optional Comment can also be saved with the entry. Unless the entry is for a Loss or Adjustment, these comments will not be shown on your operations report but will be shown in your daily records and in the Entry Log. After you’ve made your entries, click Save to apply. These entries will be stored by the software, used in the necessary calculations, and will be entered into the TTB forms for you when you print out your reports. There are 2 recommended ways to correct a mistake. Option #1 – Edit the entry on the Entry Log or Batch History page. Option #2 – Delete the entry by using the Delete buttons on the Entry Log or Batch History and re-enter the correct entry. Use care when deleting entries! It cannot be undone. Refer to “Making Corrections to Entries” on how to edit an entry or delete an entry. Entries on this page all have to do with Beer being Made (and cereal bev’s) and the materials used in making the beer, packaging, and selling. This page contains most of the important information needed to fill out your reports. PLEASE NOTE that unless you are making entries for reports in 2015 or earlier, there is no need to enter Materials Used for your operations reports. This information used to be required on earlier versions of the operations report but are no longer. They will, however, show up in your Daily Records if you do choose to report them. How much Wort did you produce? How much Wort did you remove from the Brewery? How much Beer did you produce? How much water or other liquids did you add in the Cellar? How much Hops did you use? How much Hop Extract did you use? What would be the equivalent amount of Hops for that amount of extract? What other ingredients did you use? How much Beer was transferred to racking? How much of this was actually racked to kegs? Was any amount not kegged and returned to the Cellar? How much beer was transferred to Bottling/Canning? How much of this was actually Bottled/Canned? Was any amount not bottled and returned to the Cellar? How much beer was sold at a Tavern on brewery premises? How much beer was consumed on brewery premises (ie. Tasting Room)? How much beer was removed from the Brewery for Consumption or Sale? Removed for a Pilot Brewery? Removed for supplies on vessels or aircraft? Transferred to a distilled spirits plant? Removed for use in manufacturing? originated from a different brewery that is under the same ownership? How much non-tax paid beer was received from a pilot brewery or a different brewery that is under the same ownership? received from a distilled spirits plant? Entries on this page all have to do with Losses, Shortages, Overages & Other Circumstances that would affect your beer inventories. Sometimes, it will make sense to record losses of beer that might occur during a normal process. For example, if you dry hop any beer, you will need to record beer ‘losses’ due to the hops absorbing some of the beer that is no longer available to be sold. If losses, shortages, or overages occur due to some special circumstances (fire, theft, flood, etc. ), you might also want to be in contact with your TTB Specialist. Do you have any beer losses due to Theft, Breakage, Spillage, etc? Have you found any beer Shortages while checking inventory? 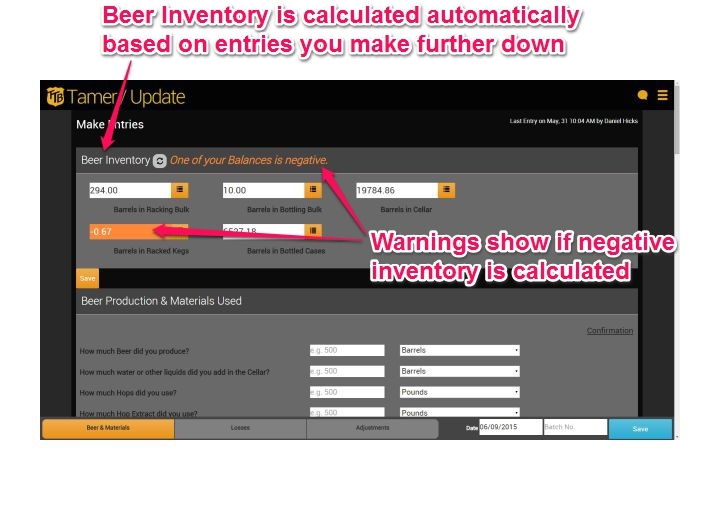 Have you found any beer Overages while checking inventory? If you make an entry on this page, you will be required to enter in an Explanation that will be printed in the Remarks section of the operations report. You can review the remarks made in the Entry Log. As you might have already guessed, entries on this page all deal with Tax and Beer Adjustments. Chances are, if you need to use these pages, an accounting or inventory error has been discovered and you will also need to be in contact with your TTB Specialist for advice. If entries are made on this page, an explanation is also required. This will automatically be placed in the Remarks section of the appropriate TTB report. This section will be used if you are required to make a tax adjustment (ie, you sent a check in the wrong amount, check wasn’t received, etc.) or a mistake in the amount of beer sold (and therefore incorrect tax) was made. Do you need to enter 50 ounces of hops used but don’t know off hand how that converts to pounds? Not a problem! Select the easiest weight or volume from the drop down window and the software will convert it automatically for you. All volume measurements will be automatically converted to Barrels. All weights will be automatically converted to Pounds. If you have a common measurement that is not currently provided, let us know and we’ll be happy to add it into the software for you!